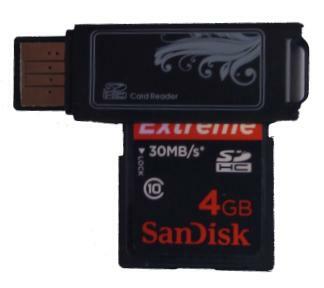 This small USB card reader lets you use any SDHC card or MMC card as a USB drive on your PC. I got this from DealExtreme, and the best thing about this device is that it is small and for $1.87, it included shipping to Australia. I bought this so I could use the superfast 30MB/s Sandisk Extreme 4GB SDHC card that I bought to use with Windows 7 ReadyBoost to improve the performance of my old Pentium 4 PC, which does not have an inbuilt card reader. Naturally, it is small and made of plastic, so it is not designed to be thrown around or run over, but it is excellent value for money. I connected to this to a dedicated USB port at the back of my PC, directly located on the motherboard to get maximum speed. If I connected it through a hub, it would have shared bandwidth with the other devices. Also, I wanted it out of the way and not visible from the front of my computer. It can also be used with a microSD card if you have an adapter.